Customer service isn’t a department – it’s a philosophy that includes every person and aspect of the best and brightest organizations. Membership: What if you treated the people you serve like members instead of customers? Serious FUN: What if your team felt a sense of fulfillment and enjoyment that made them loyal to you and your customers? Partnership: What if you customers thought of you as a partner rather than just another organization? Hiring: What if you could implement innovative hiring processes to support your customer-service mission? The After-Experience: What if you could create a memorable, positive experience after someone did business with you? Community: What if you could create a community of evangelists – loyal customers who brag about you to their friends and associates? Walking the Walk: What if every person in your company didn’t just deliver, but also lived and breathed your vision for amazing customer service? Throughout the book, Hyken shares more than one hundred insightful examples from fifty role-model organizations that prove these strategies can and should be implemented immediately – by any organization, large or small. I first heard Shep Hyken speak on a video talking about an extraordinary cab experience he had on a trip to Dallas. I was hooked – and I think you will be, too. The Amazement Revolution is not just stories and examples – at the end of the book, Hyken has condensed the seven strategies down into “brainstorm worksheets” that your organization can use to put ideas into action. How will you amaze your customers today? 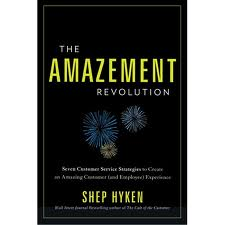 This entry was posted in All Because of Books, Book Reviews and tagged Customer Experience, Shep Hyken, The Amazement Revolution. Bookmark the permalink.